A Virginia archaeologist is using modern technology to locate and mark gravesites in the older half of Old Plateau Cemetery. The cemetery is at Bay Bridge Road and Cut-Off Road, near the Cochrane-Africatown Bridge. 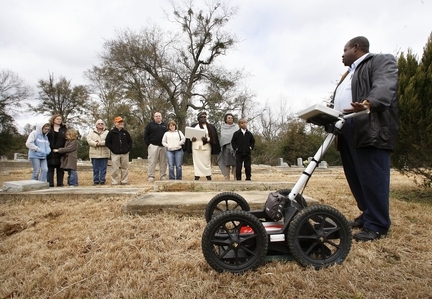 Often known as Africatown Cemetery, it is the final resting place for Cudjoe Lewis and 109 other surviving African slaves from the slave ship Clotilde. On a Sunday in July 1859, the Clotilde, also known as the Clotilda, struck a sandbar the Mobile River. The federal government had outlawed slave importations since 1808, but slavery still was legal in Southern states. The Clotilde was the last ship known to have carried African slaves to the United States. After the ship's slaves were freed, they founded Africatown in what is now Plateau and Magazine Point.